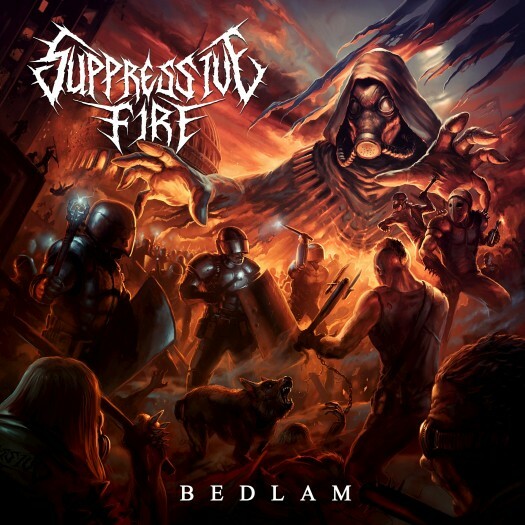 You can get a sense of what Suppressive Fire has to offer just by looking at the cover art for their debut full-length, Bedlam. In a burning, apocalyptic urban landscape, a snarling wolf stands his ground in a circle of masked fighters as a Kylo Ren-esque overlord towers over the scene. This is nihilistic, blackened military thrash; inspired by the Teutonic masters Kreator and Sodom, as well as Death and Toxic Holocaust (Joel Grind mixed and mastered the album). There’s no build up, interlude or anticipation with this band. Instead Suppressive Fire blasts you right in the face with the first note of “Ceasefire,” then slams you with a full-on tremolo-picked assault. The only mood you feel is sheer adrenaline-rush fight-or-flight terror as you’re thrust headlong into the blood-and-flesh-filled trenches. 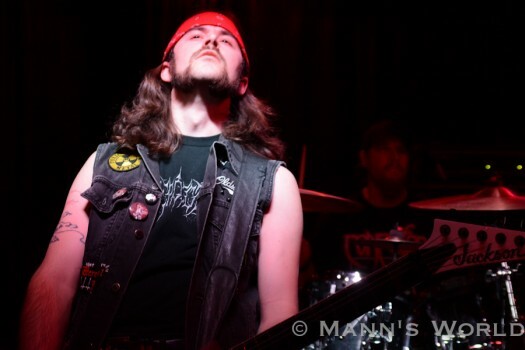 Bass player/vocalist Aaron Schmidt delivers lyrics like “the war will never end” and “death, the only goal” in a caustic death growl. Each song feels like a new battle where the nameless and faceless will be mown down mercilessly with blast beats and searing guitar. The war continues on songs like “The Hellwraith,” “Nazi Face Melter” and “Coup d'état,” which showcases some Thin Lizzy-inspired licks. Suppressive Fire does occasionally slow down, as on the opening, doomy riff of “Thy Flesh Consumed,” and the beginning of the final song, “Bedlam.” But such interludes only offer a brief moment to catch your breath before being sent back into battle. 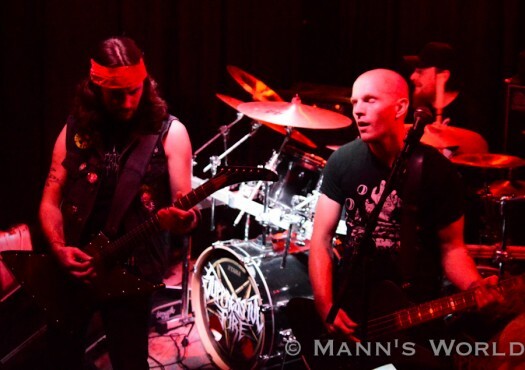 Check out Karen's blog for more photos and a live video of “Nazi Face Melter”.